We’d love your help. Let us know what’s wrong with this preview of Massacre on the Merrimack by Jay Atkinson. To ask other readers questions about Massacre on the Merrimack, please sign up. "[A] little before break of day when the whole crew was in a dead sleep…one of these women took up a resolution to imitate the action of Jael upon Sisera, and, being where she had not her own life secured by any law unto her, she thought she was not forbidden by any law to take away the life of the murderers by whom her child had been butchered. She heartened the nurse and the youth to assist her in this enterprise, and they all furnishing themselves with hatchets for the purpose, they struck su "[A] little before break of day when the whole crew was in a dead sleep…one of these women took up a resolution to imitate the action of Jael upon Sisera, and, being where she had not her own life secured by any law unto her, she thought she was not forbidden by any law to take away the life of the murderers by whom her child had been butchered. She heartened the nurse and the youth to assist her in this enterprise, and they all furnishing themselves with hatchets for the purpose, they struck such home-blows upon the heads of their sleeping oppressors that ere they could any of them struggle into any effectual resistance at the feet of those poor prisoners…"
If you’ve never heard of Hannah Duston, I can give you all the necessaries (except the exact spelling of her surname, which has several variants) in a single paragraph. In fact, I’ll do that right now. On March 15, 1697, Abenaki raiders attacked the English village of Haverhill, Massachusetts. The Indians took thirteen captives, including a woman named Hannah Duston and her week-old infant, Martha. A short time later, one of the warriors killed Martha to stop her from crying. After a march of approximately 100 miles, the captives were split up into smaller bands. Hannah traveled with two companions (Hannah’s nurse, Mary Neff, and a boy named Sam) to an island at the junction of the Contoocook and Merrimack Rivers. There, while the Abenaki slept, Hannah and her two companions took up axes and killed their captors. The butcher’s bill: two warriors, two women, and six children. Hannah, Mary, and Sam set out in a canoe, but Hannah made them turn around so that she could collect her prize: Ten scalps, which she later presented to the Massachusetts General Assembly. Even though Massachusetts’ governor had ceased paying a scalp bounty, Hannah was awarded fifty pounds. That’s all you need to know about Hannah’s saga. And I use the word need loosely. Hannah’s captivity, vengeance, and escape are not world-historical events. Rather, this event is better described as a striking, bloody vignette, a uniquely American anecdote that vividly symbolizes the brutal struggle for this continent. 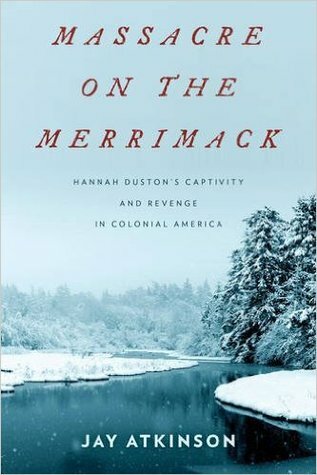 When I picked up Jay Atkinson’s Massacre on the Merrimack: Hannah Duston’s Captivity and Revenge in Colonial America, the first question I had is: How do you make a book out of this material? Duston’s story has only one primary source, that being Cotton Mather, who took his first-person interview with Hannah and wrote about it in three separate publications, changing and expanding it to meet his needs. (The works are Humiliations Followed with Deliverances, Decennium Luctuosum, and Magnalia Christi Americana, just in case you have literally nothing else to do in this life). There just doesn’t seem to be enough to fill out even a relatively brief book. (Massacre has 213 pages of text, and 81 pages of annotated notes that I found essential to read). The subject intrigued me, but I didn’t want to read a bunch of filler. Well, there is a lot of filler here, and necessarily so. But I was pleasantly surprised at how well the filler is presented. Atkinson takes a slim thread of a story and weaves it into something that is almost entirely satisfying, and at times, incredibly gripping. If you’ve ever read War and Peace (I read it solely to start sentences with "If you’ve ever read War and Peace") you will recall that Tolstoy struggled with his theory of history. Was it individuals who changed the world, or larger forces beyond any one person’s control? For a long time, historians worked under the “great man” theory, focusing on the lives of important leaders. Tolstoy clearly mocked this form of historiography, arguing instead that broader societal, economic, and cultural drivers forge historic events, rather than individual people. The reality, I think, is somewhere in between. Hitler didn't create World War I, Versailles, and the Great Depression, but he certainly harnessed the historical moment in a specific way. If someone else beside Hitler had risen to lead Germany, history is much different. Atkinson hits that sweet spot in the middle. He delivers both the macro context and micro details of this story. Hannah’s journey is the heart and soul, of course. However, Atkinson intersperses this narrative thread with other chapters that cover the background leading to the Abenaki raid. There are chapters that leave Hannah entirely in order to trace the sad history of Massachusetts-Indian relations. Atkinson also provides a decent description of King William’s War, a religious conflict between French Catholics and English Protestants that played out in Colonial America. I found this presentation to be really satisfying. Instead of the Abenaki raid occurring in a vacuum, Atkinson shows us people caught up in larger events. As individuals, they have choices, but those choices are also circumscribed by things far bigger than themselves. Atkinson is a fantastic writer and his retelling of this old tale is brilliant and evocative. For instance, there is a marvelous scene set in a homestead before an Indian raid. The tension Atkinson evokes had me skipping ahead to see what happened. The level of detail is astounding. It is, in fact, unbelievable, and this is worth noting. I would not classify this as a straight history. This is, to use a trendy paradoxical phrase, a nonfiction novel. As I mentioned above, there is a dearth of primary sources on Hannah Duston. Thus, Atkinson has to construct his narrative using other methods. For example, during Hannah’s revenge, Atkinson describes the sound of the axe hitting Abenaki skulls. Does that info come from Hannah? No. Instead, Atkinson interviewed Dr. Aloke Mandal, a trauma surgeon based out of Los Angeles. Mandal described to Atkinson the sound an axe might make hitting a skull, and Atkinson used that in his book. Is this likely accurate? Probably yes. Does this make it into a peer-reviewed quarterly? Absolutely not. Another example is the terrain and topography. Atkinson is really good at describing the physical nature of Hannah’s trek. His information does not come from 17th century sources, but from his own experience following in her footsteps. It is effective, to be sure, but I know there are people out there who can’t stand this kind of speculation. You might have guessed by now, but this didn't bother me in the least. First, anyone who thinks there is one true account of any historical event is laboring under a minor delusion. Even when we have eyewitness accounts, those accounts are distorted by human fallibilities. They can be mistaken, exaggerated, excised, and spun; they can be warped by time and failing memory; they can unconsciously incorporate outside information. Seriously, if we are being honest, even the most heavily sourced historical events only amount to an approximation of what happened. Secondly, Atkinson is allowed some artistic license. As far as I can tell, the gaps he fills in the record do not change the essence of any essential fact. When he writes about how the cold air felt on Hannah’s skin, it doesn’t really matter. He’s making the story more readable without irrevocably perverting the record. That’s my opinion, anyhow. If you are a stickler for citations, this will likely infuriate you. (On the issue of sources, it is worth mentioning that Atkinson relies heavily on 19th century secondary sources, without any discussion on how those books came by their information. The mere fact that a book is old does not transform it into a primary source. There is a very graphic scene in Massacre in which an Indian does a terrible thing to an infant involving hot coals. The citation for this is to a secondary source. I need to know where that secondary source got this account, especially since it was published over a century later. It may very well be true, because humans have outdone themselves being inhumane to each other. On the other hand, it is so macabre as to give me doubts as to its veracity. In any event, I need more than a cite to Francis Parkman to believe this happened). A couples issues did stand out for me. The first is relatively minor. I didn't like some of Atkinson’s nomenclature. He continually refers to the Indians as “savages.” At first, I thought this was idiomatic, and that he was using it when referring to Indians from Hannah’s perspective. The consistency of the usage proved otherwise. The same thing with “squaw.” I think it’s widely agreed that squaw does not actually refer to female genitalia; however, the word’s historic usage is generally degrading, and there are other, better words to use instead (such as, you know, “woman”). The bigger problem – the one that keeps this from greatness – is that Atkinson never tells me why Hannah Duston is important. Massacre on the Merrimack ends abruptly with Atkinson informing us that Hannah’s exploits would “eventually fade into the darkness of history.” Okay, if that’s the case, why do you think it deserves a new airing? What relevance does she have for us? Reading this book, you get the sense of a piece of art being painted before you. Atkinson goes into the detail of colonial America and several precipitating events to present the history that surrounds the story - the bias of the time, the political gamesmanship for control, and the intense financial drivers that form the backdrop to the scene in the foreground. A woman forcibly taken, marched through the NH wilderness in the freezing cold, subjected to brutal conditions and acts, all spurned on Reading this book, you get the sense of a piece of art being painted before you. Atkinson goes into the detail of colonial America and several precipitating events to present the history that surrounds the story - the bias of the time, the political gamesmanship for control, and the intense financial drivers that form the backdrop to the scene in the foreground. A woman forcibly taken, marched through the NH wilderness in the freezing cold, subjected to brutal conditions and acts, all spurned on by french-sponsored raiding parties by local American Indian tribes. To critics that cannot restrain from romanticizing and placing a euphemistic lens on history, try spending 2 weeks in the NH wilderness without supplies or shelter, dressed as they did in this story, and follow the path they traveled. You'll endure cold temps ranging from a 48 degree high to a 23 degree low with snow still occurring. That's what NH is like in mid to late March. Picture being forced through river crossings that soak your feet and legs. Even by today's standards with the advanced protective clothing available, such a trek is daunting. You feel the brush of snow and bone-chilling cold of the water because Atkinson experienced them, and has mastered taking an event where the ending is known and puts you into the midst of the story to feel the fear, chills, exhaustion, and near hopelessness. Everything here is rich in history and offers an expansive big picture to include the manipulation and misunderstandings between American Indians and European colonizers in North America and Canada. We're presented with clash of cultures and conflicting values on all sides, as well as subtle inner conflicts within each society. The American Indian was often cruel to their enemies, but early settlers were also blinded by religion conveniently defined for their purposes. And, as is still true today, following the money always leads back to the root of an issue -- a truth borne out in this story. 1. The jumping around back and forth in time, in several tangential stories about Hannah Bradley and the history of the French, the English, and the native people of America. 2. Most of Hannah's account was taken from the one contemporaneous written account of the story, which was written by Cotton Mather. Let's not forget his ugly role in the frenzy of the Salem witch trials. He may have gone to Harvard and he may have been a minister, but his trade was in whipping up the most sordid, dramatic, and UNTRUE stories of the time. I'd rely on his account being factual as much as I believe the headlines in the Weekly World News. Shame on Atkinson for not calling this a work of historical fiction--emphasis on fiction. Atkinson delivers a retread of a story as told to Cotton Mather (of Salem witch trials fame), and retold by such literary lights as Whittier, Hawthorne, and Thoreau. This story of a Puritan woman's capture by "savages" and escape after slaughtering and scalping an entire encampment of sleeping Indians, became a Victorian trope and parr of the justification for 19th century Manifest Destiny. Ultimately, Atki Shame on Atkinson for not calling this a work of historical fiction--emphasis on fiction. Atkinson delivers a retread of a story as told to Cotton Mather (of Salem witch trials fame), and retold by such literary lights as Whittier, Hawthorne, and Thoreau. This story of a Puritan woman's capture by "savages" and escape after slaughtering and scalping an entire encampment of sleeping Indians, became a Victorian trope and parr of the justification for 19th century Manifest Destiny. Ultimately, Atkinson's lurid imagining of the saga, with a fig leaf of historical references, perpetuates offensive stereotypes of Native Americans. Atkinson brilliantly researched and wrote an outstanding read of the ordeal of Hanna Duston. In 1697, in Colonial Massachusetts , she was captured by Abenaki Indians. She escaped with two others and got revenge by killing ten of her captors and taking their scalps. She returned to her home and what was left of her family. Atkinson does a great job in describing the stark and brutal dangers that they faced. Duston's revenge is debated to this day. An outstanding history that is highly recommended. An exciting narrative of the trials of Hannah Duston of Haverhill. But the book has a remarkable typo (1863 for 1683) and one continuing error: Throughout the story Atkinson uses "musket' and "rifle" interchangeably. Although rifling was invented for large field weapons in the fifteenth century, It is highly unlikely that English colonists and Indians had access to them in the late 1600s. In fact most English soldiers carried muskets over a century later in the War of 1812. Hannah and Thomas Duston are my husband's 9th great-grandparents. I can't believe all that Hannah had to endure---I am in awe of her. When I saw that this book had been written, of course I had to buy it! I was not disappointed. The author apparently did a ton of research, including retracing Hannah's route. Thank you for writing this book! Minus a star for referring to Native women as "Squaws" no matter the historical context and minus a star for narrating passages with information that could not be known such as what Hannah Duston and Hannah Bradley felt. I also found the jumping back and forth between the two Hannah's captivity narratives, Bradley's which happened two separate times one with Duston's and one separately, and through time disorienting and hard to follow, especially when he referred to the the Hannah's as Hannah or Minus a star for referring to Native women as "Squaws" no matter the historical context and minus a star for narrating passages with information that could not be known such as what Hannah Duston and Hannah Bradley felt. I also found the jumping back and forth between the two Hannah's captivity narratives, Bradley's which happened two separate times one with Duston's and one separately, and through time disorienting and hard to follow, especially when he referred to the the Hannah's as Hannah or Duston or Bradley, or Goodwife etc. True story: 1697, Haverhill, Mass. Abenakis raid Haverhill, Mass, take captives, including Hannah Dustin, who a week prior had given birth to her zillionth baby. The raiding group trudge the group northward, many die, are killed (inc Hannah's baby) etc. Eventually, Hannah and 2 others--one is the woman who had been caring for Hannah after the birth, another a teenage boy from another villag--are taken with an Abenaki family group of a dozen or so to Concord, NH. They overnight on an island in th True story: 1697, Haverhill, Mass. Abenakis raid Haverhill, Mass, take captives, including Hannah Dustin, who a week prior had given birth to her zillionth baby. The raiding group trudge the group northward, many die, are killed (inc Hannah's baby) etc. Eventually, Hannah and 2 others--one is the woman who had been caring for Hannah after the birth, another a teenage boy from another villag--are taken with an Abenaki family group of a dozen or so to Concord, NH. They overnight on an island in the Merrimack River. That night, Hannah and her two fellows TOMAHAWK THE ENTIRE GROUP IN THEIR SLEEP (well, 2 escaped, one never seen again, the other in not good shape). Then they have a harrowing journey back down the river by canoe, and yadda yadda yadda, make it home again. The book goes well into the relationships and issues between the native tribes. A very complex setup, indeed. And, natch, I knew little to nothing about this what with my white girl education. Very interesting. I really enjoyed this book about a local heroine. It's well researched but doesn't mindlessly reproduce the biases of the source material. Our views on Native Americans has changed greatly in the more than 300 years since Hannah was taken captive, and Atkinson tells the story with that in mind. He looks at both sides, showing the hardships and the cruelties of both the Native Americans and the Europeans. His notes are well worth reading alongside the main text, enriching the story further. For al I really enjoyed this book about a local heroine. It's well researched but doesn't mindlessly reproduce the biases of the source material. Our views on Native Americans has changed greatly in the more than 300 years since Hannah was taken captive, and Atkinson tells the story with that in mind. He looks at both sides, showing the hardships and the cruelties of both the Native Americans and the Europeans. His notes are well worth reading alongside the main text, enriching the story further. I really wanted to like this book more than I did. Hannah Duston's story is fascinating and Atkinson does a good job of setting it up in a dramatic way, providing historical context, and vividly describing the documented events. I enjoyed flipping back to the end notes for additional detail as I read and learned a lot along the way. I couldn't give the book a higher rating because I was bothered by the author's interpretations and assumptions about what Duston was thinking or feeling at any given I really wanted to like this book more than I did. Hannah Duston's story is fascinating and Atkinson does a good job of setting it up in a dramatic way, providing historical context, and vividly describing the documented events. I enjoyed flipping back to the end notes for additional detail as I read and learned a lot along the way. I grew up only a few hundred yards from Salmon Brook, which feeds into the Merrimack River. When Hanna Duston escaped from her Indian captors, she stopped briefly at the home of an Englishman on her way back to Haverill. There's a stone commorating this about a mile from where I grew up, so I've always been interested in Hannah's story. Jay Atkinson does a great job explaining the background of the Indian wars, most of which were incited by wars between France and England. Thank you, Jay! Fantastic history. Well researched and written. Hanna Duston's taken into captivity by the Abenaki Indians in March of 1697 and her ultimate revenge is still debated today. Atkinson story tells of the harsh brutal reality she faced and her ultimate escape to return to what was left of her family. Highly recommended history. Great historical read. Though not for the faint of heart. I've yet to read such graphic descriptions of war, murder and kidnapping by colonial time Indians. How Hannah Duston survived and continued on is an amazing story. Having grown up around the New England area I found this very interesting and I remember some incidents from history class. I also knew the areas, towns, etc that were mentioned in the book I felt Jay Atkinson was a superb writer. Intriguing story! These events took place near where I was born & lived until I was 10. I found this to be a vivid, well-written , and well researched recreation of a violent and troublesome event in early American colonial history. I met the author at a talk and reading that he gave at the Salem visitor center. I found him to be quite accessible and his manner easy-going. The passage he read inspired me to get and read the book. As a kind of aside, (and not really a review of the book), I have to take exception to some of the criticisms leveled at the book here on Goodreads, which I found this to be a vivid, well-written , and well researched recreation of a violent and troublesome event in early American colonial history. As a kind of aside, (and not really a review of the book), I have to take exception to some of the criticisms leveled at the book here on Goodreads, which seem to condemn both the first-hand narrative approach, and the way that some of the subject matter is handled, specifically the portrayal of Native Americans as "violent savages". First issue; the narrative approach. Some have taken exception to the detailed, almost novelistic descriptions of things like specific actions and Hannah's state of mind. Although I know intellectually that these are author extrapolations, they are very good ones, based on first-hand written accounts of what happened, along with physical and forensic evidence, blended with actual, on-site, first-hand experience of the author himself, traveling the same route that Hannah traveled, under similar conditions. Second issue: The portrayal of Native Americans. The Native Americans were violent, and did behave savagely. They did so not only with the English, but also with other tribes. In short, they were humans, and like any group of people, were a decidedly mixed bag. This in no way excuses the savagery of the warfare the English waged on native Americans in their efforts to colonize and exterminate them, but it doesn't give a free pass to Native American behavior either. The unfortunate modern tendency to project modern interpretations and judgements onto actions and situations we are distantly and quite safely removed from strikes me as disingenuous and somewhat comical. I can't help but feel that these criticisms miss the entire point of the story. Although the author takes great pains to explain the political, religious and economic forces that led converted Catholic Abenaki Indians to mount the devastating early-morning, March 1697 raid , at some point, (if you are honest with yourself) you realize you no longer care what the big picture is, especially when it comes down to the basic issue of survival. The point of the story is to put you in Hannah's shoes, and in that i think it succeeds brilliantly. The big question in the book, and about Hannah herself is; was she a prototypical feminist hero, or just one of a long line of genocidal whites? Although there is some evidence that white people (like Cotton Mather) were fine with using Hannah's story to confirm their pre-existing narrative of racial superiority and devine destiny. That is unfortunate, but is not Hannah's fault, and does not impinge her credibility or basic facts of her story. And finally , I had to ask myself, what would you have done? If someone broke into your house, threatened the lives of your family, robbed you of your possessions, kidnapped you and your neighbors, burned your house down and murdered your newborn infant, what would you do? Would you care that the perpetrators suffered injustice and genocide? Would you care why they did what they did? Or would you just want to wreak bloody vengeance upon them? An intricate, evocative recounting of a particularly jaw-dropping episode in 18th-century North America. In 1697 , Hannah Duston - of whom I happen to be a 9th great-grandson - was abducted from her Haverhill farmhouse by a band of Abenaki in the early morning hours. After undergoing a forced march north, near-starvation, and the slaughter of two of her small children, she fomented a successful plan to kill (and scalp) her captors in the middle of the night -men, women and children - and canoe b An intricate, evocative recounting of a particularly jaw-dropping episode in 18th-century North America. In 1697 , Hannah Duston - of whom I happen to be a 9th great-grandson - was abducted from her Haverhill farmhouse by a band of Abenaki in the early morning hours. After undergoing a forced march north, near-starvation, and the slaughter of two of her small children, she fomented a successful plan to kill (and scalp) her captors in the middle of the night -men, women and children - and canoe back down the Merrimack to home. It's a story that squeezes all of the ugliness and contradictions and moral confusion of America's colonization into one neat package. Atkinson wisely supplements this tale with a generous helping of historical context, summarizing the shifting alliances and betrayals in the native, French and English populations in New England and New France in the century preceding Duston’s ordeal. Most of the native’s attacks on English settlers were motivated by the French, who would pay handsomely for scalps and slaves. And this is further tied to the booming trade in beaver pelts, which is delved into in a surprisingly fascinating chunk of the book. I really enjoyed this book. Hannah Duston's story is one I had never heard, despite the fact that it was one of the most often told stories in New England public education for many decades. Rich in Indian folklore, history and our New England heritage, Hannah was a symbol for the indomitable spirit of the American frontier of the 17th and 18th centuries. Hannah's capture and escape shows clearly how stark and violent our history was. As New England was being settled, the Indians were manipulat I really enjoyed this book. Hannah Duston's story is one I had never heard, despite the fact that it was one of the most often told stories in New England public education for many decades. Rich in Indian folklore, history and our New England heritage, Hannah was a symbol for the indomitable spirit of the American frontier of the 17th and 18th centuries. Hannah's capture and escape shows clearly how stark and violent our history was. As New England was being settled, the Indians were manipulated, pushed aside and hated. The French and Indian War became the focal point of greed over the profitable fur trade in the New World. Greed, deceit and corruption flourished in Quebec/France and in Boston/England. The Indian cultures of many tribes were push me/ pull me victims right in the middle. This review has been hidden because it contains spoilers. To view it, click here. Good book, might have been closer to 4 1/2 stars if read hard copy instead of on my iPhone 6....small screen and book had some “large” visualizations essential to the story. Not sure if an actual book would have made a difference since this is the first time I felt this way. Hoping it’s not a “reading on small iPhone” issue. In the end though, Hannah Duston (Hannah’s Tavern in NH) was one mean “hombra,” if that’s a word. Kicked a** and definitely took no prisoners...AFTER just recently giving bir Good book, might have been closer to 4 1/2 stars if read hard copy instead of on my iPhone 6....small screen and book had some “large” visualizations essential to the story. Not sure if an actual book would have made a difference since this is the first time I felt this way. Hoping it’s not a “reading on small iPhone” issue. The first (and only) time I ever heard of Hannah Duston was in the pages of Thoreau's book about his trip with his brother on the Concord and Merrimack Rivers. This book fills in many of the blanks for me including the backstory of Puritan/Indian relations and conflicts. It backs up my opinion that there is plenty of blame to go around as to why the English settlers and the Native Americans just could not get along. I re-read the author’s introduction to this book three times to understand why he wrote it the way he did. Major portions of this book are written as if the author was there - this can be done very well with history. Yet the excessive use of “savage” and careless language surrounding the murder of both indigenous people and settlers made this a hard and unrewarding read. What a cool book about a fascinating figure in one of the most riveting of the captivity narratives. Mixed with lots of description of landscape, as well as backstory and history of other figures like Hannah Bradley (who had a similar story to Hannah Duston) and Frontenac the cruel yet capable French leader in New France. An awesome story of a woman who survived the trials and tribulations of an Indian attack on her home. And for me a well illustrated picture of the early days of Massachusetts and the places I’m familiar with. Well written about a little appreciated time in New England history, Provo Jay Atkinson!